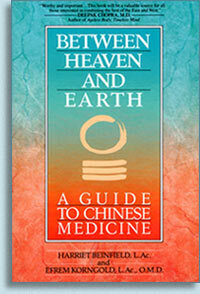 Combining Eastern traditions with Western sensibilities in a unique blend that is relevant today, Between Heaven and Earth addresses three vital areas of Chinese medicine – theory, therapy, and types – to present a comprehensive, yet understandable guide to this ancient system. Whether you are a patient with an agravating complaint or a curious intellectual seeker, Between Heaven and Earth opens the door to a vast storehouse of knowledge. As Chinese medicine takes root in our terrain, it evolves to adapt to our environment. Does a botanist hiking along steep slopes move through the same forest as the native tribesman? Is a mountain that endures the ages the same even though climbers see variable landscapes from epoch to epoch? What the mountain means to people and how they use it changes with each traveler or caravan. Ideas, more mutable and malleable than landmasses, are even more liable to change form. The ancient Chinese had their own mythos, language, circumstances, preoccupations, and we have ours. This book represents a nexus, a point of convergence, a meeting of worlds. Between Heaven and Earth is a cross-cultural transmission and transplantation. In transposing Chinese ideas into our own idiom, our challenge has been to bridge gaps – between mind and body, theory and practice, therapy and self-care, practitioner and patient, ancient and modern, convention and invention, East and West. We have dug into and mined the rich ore of Chinese medicine for the purpose of creating new metal, a refined alloy. Through cultural blending, we are transmuting wisdom from early China into what has relevance for us today. Welcome to an ongoing process. We began to practice acupuncture in 1973. Since then we’ve treated thousands of Americans. One was Sam, a 36-year-old biochemist, who had an excruciating pain in his abdomen diagnosed by his doctor as gallstones. Although he felt skeptical about Chinese medicine, he was more frightened by the prospect of surgery. After two months of acupuncture, herbs, and dietary modification, Sam expelled scores of stones, and a sonogram confirmed that surgery was no longer necessary. Esther, a retired 75-year-old nurse, had severe arthritis. After a year, she was free of pain and had recovered the use of her joints and limbs. Fifteen years later, she’d had no recurrence. Yet another person was Suzanne, who at age 28, after three miscarriages and two gynecological surgeries, was unable to conceive. In the eighth month of treatment, she became pregnant and later delivered a healthy daughter, now herself a mother. You can order Between Heaven and Earth from Redwing Books or amazon.com or other bookshops. This book is also available in Spanish, Hebrew, Dutch, German, Russian, Polish, and Czech.